As a print service provider, you seek to streamline your sign orders and get timely digital proofs that cost as little as possible. Today, signage industry seeks universal solution that will allow their customers post DIY sign orders, and automating orders without spending much time on corrections and trades of the quote emails. Easy sign design tools changes sign creation task into a smooth and fun experience for end users. Allow your customers creating superior signs online with LiveArt HTML5. Tailored specifically for signs, banners and clean decals design, the sign designer allows adding preset or arbitrary sized product templates and configuring width or height constraints if necessary. The sign mode of LiveArt HTML5 Designer features product setup and tools that make sign design process an exciting and effortless experience. Open for any functionality development, extension or customization! 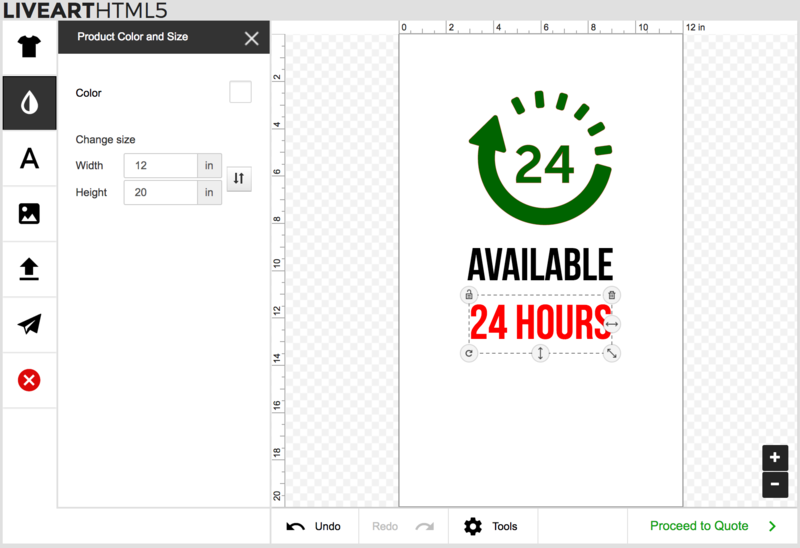 LiveArt HTML5 Designer, as sign design tool, can be used as standalone web app, or part of Magento, WooCommerce or nopCommerce plugin, installable at your premises. Banners USA offers huge assortment of ready-made banners, signs and pennants. Using sign designer from LiveArt, Banners USA supplies their customers with superior quality of products, accessory art and designing capabilities. Wallwords provides their customers with live design studio for designing their unique wall decal using rich text effect capabilities and live preview against custom sized wall.